Balanced nutrition is crucial during childhood to support normal growth and cognitive development. 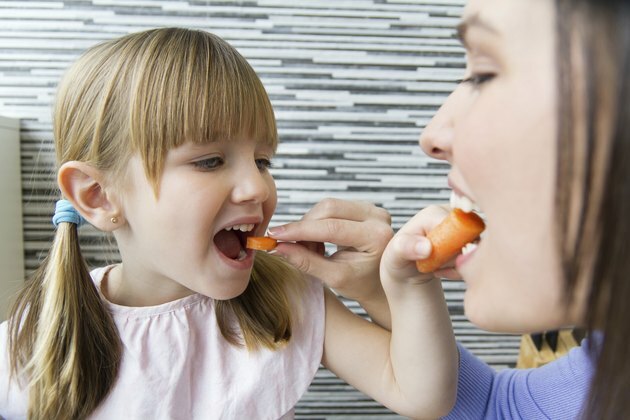 When children are fed unhealthy foods, certain behavioral problems can begin to arise. Among the most common of these are attention deficit hyperactive disorder, irritability and aggression. Poor diets that are high in sugar, fast food, artificial food additives and trans fats have been studied for their potential links to these behavioral issues. Although the cause of ADHD is unknown, the authors of a 2011 paper published in "Postgraduate Medicine" theorize that excessive sugar intake over an extended period of time could lead to symptoms associated with the condition. The cause may be related to the disruption of chemicals in the brain, which can affect the reward-related regions of the brain. A study published in 2012 in "Nutrition" recorded significant independent relationships between sugar and fast-food consumption and ADHD. Although there is no concrete evidence, a meta-analysis published in the "Journal of the American Academy of Child and Adolescent Psychiatry" in 2012 concluded that the effects of food colorings on ADHD were notable, though some bias may have existed within studies. In 2008, the Center for Science in the Public Interest petitioned the U.S. Food and Drug Administration to ban some artificial food colors, based on preliminary results from studies linking them to ADHD. According Dr. David Schab, a psychiatrist at Columbia University Medical Center, behavioral problems in children improve when artificial colors are removed from their diets and worsen when they are reintroduced. Trans fats are a type of fat that can be produced synthetically. They are found in fast foods, fried foods and many prepacked foods, such as baked goods and snack foods. In addition to increasing the risk for heart disease and stroke, trans fats may be linked to irritability and aggression, a study published in 2012 in the "Public Library of Science" found. Although the study was not age-specific, trans fast in the diet in general can be classified as poor dietary choices, which could potentially lead to health and behavioral problems in children. In addition to consuming diets low in sugar and artificial ingredients, such as trans fats and food colorings, other simple choices can help keep kids healthy and potentially lower the chances of behavioral issues. These include making half your child's plate fruits and vegetables; broiling, grilling or steaming foods instead of frying them; replacing soda and fruit juices with water; serving whole grains instead of refined grains; and providing healthy proteins such as lean meats, eggs and nuts. Postgraduate Medicine: Attention-Deficit/Hyperactivity Disorder: Is it Time to Reappraise the Role of Sugar Consumption?